I was thrilled to be able to get a great buy on a bushel of Gala apples from a local orchard because the apples were a little small. One can only eat so many pies, so I decided to use some of the apples to make some raw apple cider vinegar. Ok, that’s completely false. There is no such thing as too much pie. But, I use a lot of raw apple cider vinegar, so I sacrificed my need of pie for some homemade raw apple cider vinegar. The white film is a SCOBY – symbiotic culture of bacteria and yeast. 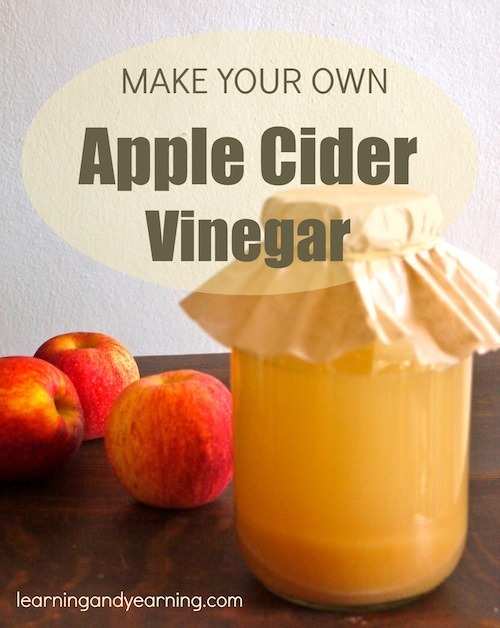 Use it to make more raw apple cider vinegar. Have you tried making your own raw apple cider vinegar? How did it turn out? 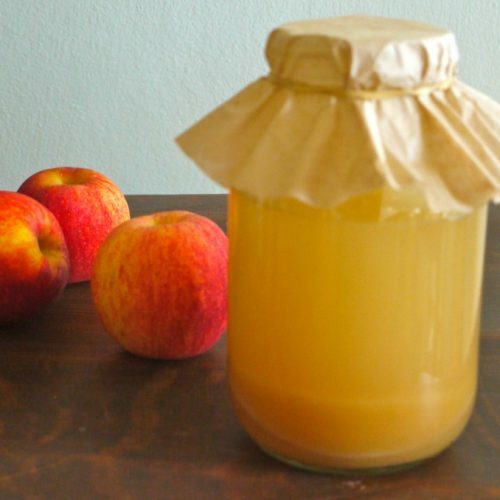 Yes, you can make your own raw apple cider vinegar! 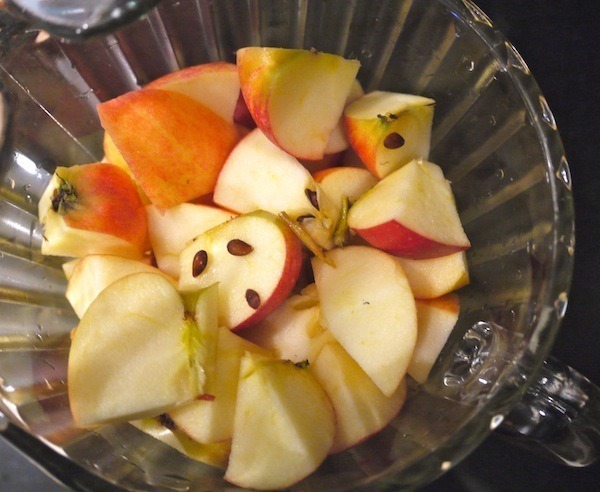 Cut 6 apples into about 12 pieces each, and place them in a 2-quart wide mouth glass jar. Add the raw honey, and the raw apple cider vinegar. Be sure to use a brand which contains the mother. Cover the apples with chlorine-free water, and cover the jar with cheesecloth, or a coffee filter. A rubber band will help to hold the cover in place. Now place this in a warm place for 2 weeks. The top of the refrigerator is generally a good place since the refrigerator throws heat. After 2 weeks, strain the liquid from the container into a glass canning jar. There should be almost a quart of liquid. Compost the apple solids, or feed to your chickens. Cover the jar again with the cheesecloth or coffee filter, and return to a warm spot. Check the liquid about once a week by tasting a small amount. You’ll know when it’s vinegar. A SCOBY may form on the top, which is great. 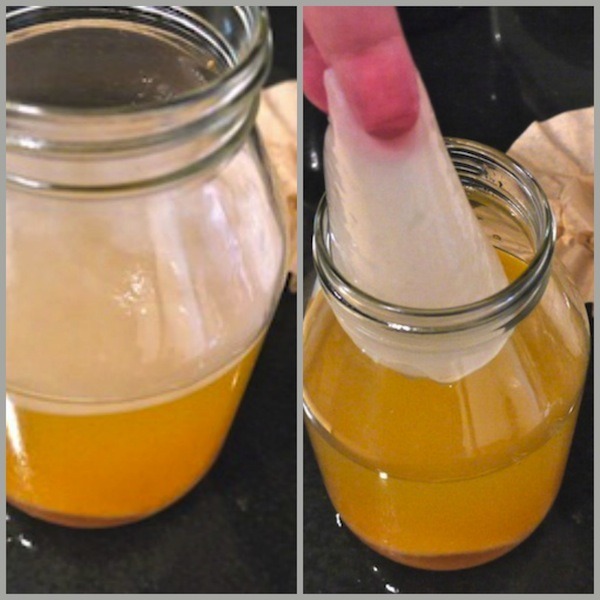 You may use the SCOBY to make a new batch of vinegar. Stop the fermentation by covering your jar with a lid and placing it in the refrigerator. Thanks, Tessa. I LOVE Black Chicken Host!!!! Amazing customer service. I’d sure appreciate it if you signed up under me, if you do decide to go with them. (Just click through my ad, and that will do it). Hi Tasha. Yes, the SCOBY is similar to the kind used to make kombucha. You may refrigerate it with some of the ACV until ready to use. Hi Susan – I have a couple ACV scoby’s and have had them in the cupboard in the bottom of the glass container with a little ACV still in the container… will they still be good or should I have refrigerated them? Shauna, if the vinegar has been kept in a cool place out of direct sunlight, it should be just fine. Love the post. I found you through the Farm Blog hop. I actually make mine with apple cores leftover from applesauce. I like that idea, Anna. I think I’ll try that next time. How many apple cores roughly? I was thinking of making some more apple sauce and apple butter (which is delicious). I could make cider vinegar simultaneously. I like that idea! I use it a lot, including on my face, but have to travel 40 kms to get it then back again. Thanks for all the good ideas! Lydia, the apples I used filled a half gallon container about 3/4 full. Why don’t you try the same amount of cores and peels? I didn’t know if it was okay to provide the link to my apple core vinegar recipe. Let me know if it is okay. I have just started to make my own acv from scraps that otherwise would’ve went out with trash. I am on my second batch and as we ate apples and used them for other things, I kept a container in my freezer to collect cores and skins until I had enough to fill my one gallon glass jar to make a batch of cider. I just ran out of Bragg’s, so this would be a great time for me to make my own apple cider vinegar. Thanks for the recipe. I’m hoping the top of our refrigerator is warm enough. We keep the house around 62 which isn’t exactly warm. Yes, it definitely needs a warm spot. Put a thermometer on top of your frig for a day to check the temp. You said the SCOBY is similar to a kombucha SCOBY, can this SCOBY be used to make kombucha? I don’t know. I’ve never tried it, but I’m inclined to think they are different from each other. What Scoby? I use Bragg’s but I don’t have a scoby. Do I purchase it separately, or is it the stuff at the bottom of the jar? Just use 2 T. of the Bragg’s as indicated in the recipe – you don’t need a scoby, although one may form in your homemade vinegar. I started a batch of ACV a month ago using a tutorial from another website. The tutorial’s directions only gave two ingredients: apple cores and distilled water. It also, did not instruct me to remove the cores, but instead to leave them in until the ACV reached my desired strength. I now I have a weak vinegar with a thin SCOBY. How can I increase the strength of my ACV at this point? Do I simply need to continue to leave it alone for another month or so, or can I add Bragg’s at this point and try to increase the strength? I am used to using Bragg’s and would like my batch to be as strong when it’s finished. I’m not really sure, Melissa. I’m rather new to this myself. My ACV came out just as strong as Bragg’s. I don’t see any harm in adding some Bragg’s and then letting it sit for a few more weeks. Let me know how it turns out. I love this post. I’ve been meaning to try making ACV for a while, but now that our house is rather cold it might not be the best time. I’ll give it a try anyway since we have a ton of apples from our yard and I will only waste a little honey and vinegar if it doesn’t work. This would be a significant savings over buying Braggs. Plus the top of my refrigerator needs a good dusting! Will this grow a “mother”? One of my 3 jars has what appears to be a scoby or something similar. The other 2 have the same thing on the sides of the glass above the vinegar, but haven’t formed a covering. Hi Myles, yes, this recipe will grow a mother. The SCOBY, or mother, won’t necessarily grow on the top, although that’s the most common place. It has to be refrigerated once it’s done? Why? Hi Marci, only if want it to stop making new SCOBYs. I’m reporting back about my vinegar-in-the-making. I wondered if it would ferment in a cooler environment. We keep our house temperature at 65° during the day and 59° at night. I’m happy to report that it is turning to vinegar, but I think it might take longer than if our house was warmer. I started the apples 3 1/2 weeks ago and it tastes like a very mild vinegar now. A mother is forming on the top. The top of our refrigerator doesn’t get very warm, so at night when we turn the temperature down I place the vinegar jar near the crockpot which is cooking bone broth all night. My vinegar is lighter in color than yours but I think that is because I used yellow apples. Oh, great! Putting it near the crock pot is a fantastic idea! Okay, I admit I’m just a fitness chick, but I had higher hopes for this than mold! LOL! I must’ve done something wrong? I guess I didn’t use chunks but rather some chunks and some bits from my juicer… maybe it was too thick which allowed the mold to form? And I put it above my fridge in cupboard, so maybe the darkness? Anyway… I strained out the solids after scraping off the mold – there was a bit of a scoby – and I’ve decided to let the juice keep fermenting. your thoughts? I’m only 1 week into it and that mold has me flummoxed! Hi Beth, what a bummer! I don’t think the darkness would have caused the mold, but perhaps the mashed juicing leftovers were too small. If the liquid left has a vinegary taste w/no trace of a moldy taste, I think it will be ok. I don’t think I would use that scoby to start a new batch, though, just to be safe. Thank you, Carol. Good info! I’ve done a lot of fermenting. If something molds you need to cut your losses and try again. The scoby should be tossed along with the vinegar to the compost pile. Sometimes it just happens. Happy Fermenting! Thank you for this recipe. So my ACV is done and I have a good healthy Scoby on top. Now how do I use it to make another batch? I also make Kombucha at home. Is it anything that? Can you just put the scoby in some apple juice or water and let it do it thing? Hi Mandy, to make a new batch of ACV, just use your SCOBY, rather than some Braggs. Yes, you may use juice, but it must be raw juice. Anyone ever had theirs turn syruppy thick? I may have to turn ‘thick’ (brave) to try it lol. Making it in too cold conditions from left over holiday cider and the bottom of an old bottle of braggs… It’s been several weeks now in the cupboard and is definitely doing something, no film yet although I may have stirred it in. It’s definitely goopy though. Cannot wait to have a gallon. I haven’t seen syrupy vinegar – hope that it turns out for you. If it takes ok, it is ok.
2 T. raw honey”? Is it 2 tablespoon? I’ve started brewing lately-kombucha, water kefir. Had some brags that formed a mini scoby. I got some unfiltered organic apple juice ’cause there’s no cider this time of year. Put baby scoby and a little braggs into a mason jar and covered with cheese cloth. It’s working slowly-cooler temps take longer but the flavor develops. That was may. It’s the end of June now and I just removed a scoby to start another jar. Tasted and it’s wonderful. Stil a little sweet, might need a few more weeks. I’m going to try with different juices now that I’m growing scobys. Cant wait until cider time. U say to cover the apples in the water, do they have tp be completely covered. If so, how because they float. Thanks! Hi Michelle, if the apples won’t stay under water, you may weigh them down with something like a small dish or a plastic bag filled with water. The bag of water worked perfectly. Thanks! So, is this pretty much full proof? The reason I ask is because that bag of water that I had in it lost all its water and I’m guessing it went into the “vinegar” (where else would it have gone lol) I actually got a little more than half a gallon of liquid. Is this an exact science where if the amounts aren’t exact it could make you sick or something? Can you tell I’m a total newbie at this stuff?? Oh dear. I hope you used chlorine-free water in the bad. Chlorine would kill the cultures. No, it’s not an exact science. You’ll know it bad if it molds or tastes off. This should taste like vinegar. Hi Do you need to use the honey in it? Could I just leave it out or use another liquid sweetener? I am vegan but really want to make it. Hi Daryl, I’ve only made the vinegar with honey, so I can’t speak from experience. I have seen recipes that use no sweeter at all, but they take longer to ferment. I’d love to hear how it turns out for you if you give it a try. Iv been making racv for years now & I use only apples and water in a gallon jar, cheesecloth on top & add more water as it dissipates. Can be done & works deliciously!! ???? Hannah I’m new to KT brewing, and my finred is SCOBY-sitting until my supplies roll in. Anyway, I’ve was told that a ceramic (and therefore, dark), lead-free crock is the way to go but then I see your SCOBY hotel in a clear glass jar. What’s up? If I cover the sides of my 3 gallon clear glass jar with a towel, will that be dark enough to brew? Thanks love your site and your energy. KT-generated, no doubt? Yes, covering with a towel is just fine! Christine, a sweeter apple will generally make a stronger vinegar. Here’s the thing, though. Some tart apples have a high sugar content, but they also have a lot of acid which is what makes them tart. If you don’t mind experimenting, give it a try! Wild apples.. Iv even mixed a few different types in the same jar & has worked great! Nice article. Lots of info here. People just need to realize there are a ton of variables here, like in any other process… too many even. Yes Braggs is raw apple cider vinegar with the mother… what ever kind of natural sugars you give her determines how she reacts and what flavor vinegar she makes for you. Lots of people just use a little sugar or alot, depending on their tastes. Remember you are feeding the scoby mother… she will consume the sugars… thats why u get vinegar! I recently started making vinegars and it is addictive and one of the most interesting projects I’ve come across. This summer I did ACV, fig, champagne, white wine, Medjool dates and pineapple varities. One thing though, nearly all developed mothers so I would just drop them into any vinegar that hadn’t developed one. Do you have an opinion on that? I would hate to have my work wasted as I anxiously await the last of them to develop. Your vinegars sound fantastic! I don’t see any problem in putting the mother from one into another. Your vinegars should turn out just fine. I’ve been searching many websites for an answer to my question, but haven’t found any that address this issue. All sites advise to remove the mother and filter the vinegar, but I’m wondering how Braggs ends up with mother particles in their product. Do they not filter? I have hard cider that’s ready to start the vinegar making process and when it’s done do I have to filter and remove all the “stuff”? To the best of my knowledge, no. I think people filter because it may look “nicer”. Have you tried contacting Braggs to ask them? Let me try… People remove the mother to use in the next batch! They filter to look nice, but , as soon as it sits for a while a new mother will form on this filtered brew!!! So don’t worry!!! You don’t have to filter, especially if your advertising its RAW, or if friends will get some to start THIER own…!!! 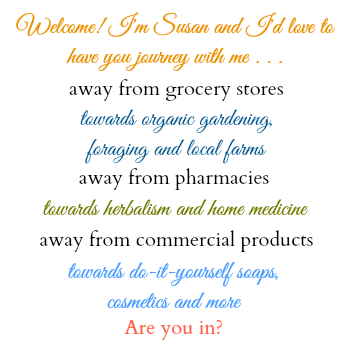 Thanks, Susan, for such extensive, awesome info; I’m thrilled to have found your site! I look forward to making ACV for the first time. I truly appreciate your making time to answer questions. So glad you stopped by and took the time to say hello, Bev! i’ve been making a lot of a c v with scraps . however my last batch turned out a little thick-more like a syrup. any thoughts ? As long as it tastes good that shouldn’t be a problem, Jim. I’m just curious, Braggs Apple Cider Vinegar does not come with a scoby. Does it matter when making this with this brand or do you recommend another brand. The only one I’ve found is from Vitacost. Bragg’s is the only brand I’ve used; it does contain the mother. It won’t look like the scoby you see in my photo but the live culture is there. I use ACV for so many things so will definitely give this a go. Thank you for the details. Most health food stores and even many grocery stores carry both raw apple cider vinegar and raw honey. The vinegar is also available here http://amzn.to/2xcBDZB, and honey here http://amzn.to/2xdQJhr. Thanks for stopping by! I also have been making my own acv for a year now and it never failed. This time it began to look more like sirup. Is it still good. It’s only a week old.